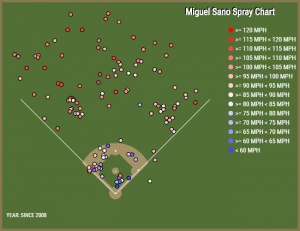 Miguel Sano: The big early riser at third base? Earlier this week, I published the first installment of third base rankings for 2016. Those rankings featured no surprises at the top, but the third tier did bring about a bit of intrigue and basis for discussion. Smack dab in the middle of that third group was Minnesota Twins third baseman/outfielder/designated hitter Miguel Sano. Overall, he was ranked 13th. While that initial edition of the rankings will change almost immediately once the season gets underway, it certainly stands to reason that Sano could very well be among the quickest risers this fantasy season. Opinions on Sano have, interestingly enough, differed slightly across the board. Some sites have him near the top of their third base group, while others have omitted him entirely. That could also be related to the question of his position. The Twins have insisted that they’ll try him in the outfield, but he’ll also be taking plenty of hacks as a DH. If he can manage to carry third base eligibility, though, he could quickly jump up in the rankings, perhaps to the top of the next tier, if not even be a member of the elite group, from a fantasy perspective. Sano didn’t get quite the fanfare that some other blue chip prospects did upon their arrival to the big leagues, but such is life when you play for the Minnesota Twins. Nonetheless, there was a lot to like about his game and where his numbers ended up on the season. He didn’t have enough at-bats to qualify for the league leaderboard in anything, but he certainly would have been in the mix even with those limited ABs. There’s a lot to be impressed with from Sano, across the board. He slashed .269/.385/.530/.916. That’s incredible considering the lack of buzz surrounding him last year. The power was there, with 18 home runs and a .262 ISO. Had he had enough at-bats to qualify, he’d have had the highest walk rate among big league third basemen, at 15.8%. Additionally, if he qualified (and had 3B eligibility) he’d be at no. 12 in home runs, in only 335 plate appearances, and at the top of the leaderboard in OBP. Obviously might impressive for a rookie. But, of course, there are also critics (whose criticisms are not entirely unfounded). He struck out a lot, to the tune of a 35.5% K-rate. His BABIP, at .396, was also sky high and certainly helped him maintain that average and absurd OBP. One also tends to question his ability to knock runs in on a team that largely outperformed what they were expected of, and could be in for a regression. That’s a shortcoming that’s not on him, but a lack of support from around the lineup could be a fantasy detriment. At least as far as the strikeout rate and the BABIP are concerned, though, prospective fantasy owners could find solace in a couple of different ways. The strikeout rate would appear to be something of an anomaly. He swung at only 40.8% of pitches overall and just 25.8% outside of the strike zone. Once he makes the permanent adjustments to big league pitching, that rate should dip considerably. And while that BABIP is obviously going to regress in some form or fashion, Sano also obliterates the ball when he makes contact. He made soft contact just 11.7% of the time, and made hard contact 43.2% of the time. No third baseman hit the ball that hard that consistently. If he can continue to do that, that BABIP will remain quite high, even if not lingering around .400. Baseball Savant’s velocity spray chart for Sano is largely a very gorgeous shade of red. When you look at it strictly from a fantasy perspective (or from an offensive perspective), it becomes harder to identify those shortcomings. The power is there, and the pitch recognition is far better than the K-rate would indicate. Each of those ideas points to him being a strong fantasy play for the 2016 season, really regardless of position. For our specific purpose (“our” meaning “my” as the third base guy here on RotoGraphs), however, there is obviously some concern. Of course, all of this is moot if Miguel Sano loses his 3B eligibility. And that’s where the concern truly lies. In terms of his ability to generate offense for the Twins and for a fantasy squad, Miguel Sano is going to be a horse. On a team still riddled with questions, Sano demonstrated in only 335 plate appearances that he’s going to be a force to be reckoned with at the plate. But the lingering threat of permanently losing all third base eligibility definitely gives us pause, and is the primary reasoning behind me sticking him at no. 13 among the big league third basemen. In some cases, he already has lost that eligibility. So in those initial rankings, it was difficult to throw Sano higher than that 13th spot without entirely knowing what his positional status will be throughout 2016. Trading Trevor Plouffe, an idea that refuses to go away, could open the door to him saving that third base status and cementing himself among the third basemen. And at that point, he’ll likely shoot up our rankings with ease. While it isn’t a sure thing by any stretch, the preseason allows us to cling to hope that he’ll remain a part of the third base group from a fantasy perspective. Until that dream is dead, we can continue to live in ignorance and certainly approach this season with the expectation that he’ll quickly shoot up those rankings. Or any rankings. We (I) just hope their ours (mine). We hoped you liked reading Miguel Sano: The big early riser at third base? by Randy Holt! Are these tiers of yours for dynasty leagues? If not, what happens to his eligibility next year should not factor into the rankings. Sano has 3B eligibility in some leagues, like Ottoneu, but not in ESPN. It seems like you should either include him or not and not consider what his eligibility is in other years or various formats as a factor in the rankings. Exactly my thinking. What is the point of ranking him at all at 3rd base if you’re going to dock him for not being third-base eligible? He’s either ranked there, or he isn’t.